WASHINGTON, D.C. (Sept. 25, 2017) -- National Association of Black Journalists (NABJ) President Sarah Glover announces that the organization is naming Sharon Toomer, an accomplished media executive and nonprofit leader, as its new executive director. The announcement today comes after an intense selection process and extensive national search facilitated by Harris Rand Lusk. "We are excited that Sharon will be joining us at this critical time in NABJ's history," Glover said. "Her combined fundraising, organizational, executive management, journalism, and public affairs experience and skills make her a dominant force. Sharon is experienced, visionary and passionate. We feel confident that she will serve us well in the implementation of NABJ's strategic plan and be an impactful leader that shapes the national office as NABJ continues to grow and evolve. "NABJ is so very fortunate to have Sharon onboard." Citing Toomer's vast experience in public affairs, communications, journalism and new media, as well as her professional and organizational skills, Glover said the Spelman College graduate was very impressive throughout the process and exhibited several traits that will serve NABJ well. "NABJ is making big strides. We are raising the bar, and capacity building our beloved NABJ," Glover said. 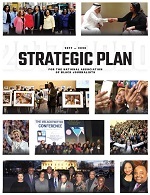 "Strong leadership is critical as members are responding positively to the improved value NABJ provides and, equally important, the media industry needs NABJ to be forward-thinking now more than ever. Sharon's dynamic leadership is right on time." NABJ secretary Cheryl Smith agreed. "While her resume was impressive and displayed the depth of experience and leadership necessary to lead the national office, also of significance is Sharon's passion, commitment, work ethic, management skills and sincerity," Smith said. "There's no doubt in my mind she is the ideal person who will be of great benefit." For Toomer, joining NABJ as executive director, "Is a rare moment in my career lifespan when opportunity, preparedness, shared interest and timing intersect." Definitely no stranger to the organization, Toomer said she considers it a privilege to work for an organization that she personally knows has made a difference for so many. 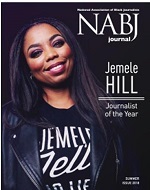 "Since its founding, NABJ continues to be an essential pillar in the journalism and media landscape. In the world we're living in today, the talent, skill, perspective and nuance of NABJ and its members is even more urgent in journalism," she said. "Together, with an outstanding board, I look forward to advancing NABJ's mission, raising its profile and strengthening its capacity." Prior to joining NABJ, Toomer served as senior vice president for public affairs and policy at Matlock Advertising & Public Relations, where she led the agency's Reputation Group in its work with a diverse portfolio of clients representing the corporate, nonprofit, academic and business sectors. Toomer has also served as chief of staff and senior policy advisor for U.S. Representative (D.C.-Shadow) Franklin Garcia. Toomer has also worked as an editorial producer for CNNfn and CNN Headline News and founded the award-winning digital news platform Black and Brown News. As a communications professional, Toomer served two Kings County (Brooklyn, NY) District Attorney administrations. She also worked for the Association of Black Foundation Executives, the Brooklyn Borough President's Office and the City University of New York faculty union. A past recipient of CUNY's Graduate School of Journalism Political Reporting Fellowship, Toomer's wide-range of experiences and multicultural worldview has earned her awards in journalism excellence, and appearances on television, radio, print and digital news outlets. Her diverse viewpoint brings nuanced insight and added value to the workplace, projects and dialogue on key issues of the day. NABJ Treasurer Greg Morrison also expressed excitement about Toomer. "I've known Sharon since she was a college student and I have watched her mature and develop as a team player and leader," he said. "She is definitely more than prepared to lead our national office. We are looking forward to great things under her tenure and I know she will make us proud." In addition to her organizational skills, Toomer expounds on key issues of the day. Next month, her perspective and writings on community violence and trauma will be published by the National Academy of Medicine's expert paper collection, Health Equity and Social Determinants of Health. Glover said Toomer is expected to begin on Oct. 9. An advocacy group established in 1975 in Washington, D.C., the National Association of Black Journalists is the largest organization for journalists of color in the nation, and provides career development as well as educational and other support to its members worldwide. For additional information, please visit www.nabj.org.